Well who’d a thought I’d make it a full week. I bet some of you didn’t….! And just for you doubters, in the style of ‘Hot Fuzz’ here’s a big two fingers and a ‘jog on’. I did blow a raspberry but it’s really hard to try and spell it?! So today was another mission of 37km, it wasn’t planned, I just did a ‘Forrest Gump’ and kept on walking. So, I left at just gone seven, once more walking into the clouds. My plan was to reach Espalion by early afternoon, a modest 27km. I had planned to stop for lunch today, just to make a change. Well that didn’t happen! The route, despite being beautiful, was monstrously tiring today, with scenic detours that seemed pointless because of the haze, climbing up and then back down the sides of valleys for no other reason than ‘shits and giggles’. (Now remember there are reasons the route follows the path it does but who am I to get in depth about it, when the sweat is pouring from my head)! I did see my first snake today, very excited. I tried to scramble after it, but in my get up, I didn’t stand a chance. Lots of what I’d call weekend pilgrims on the route, they’re just walking for a weeks holiday, having their bags dropped at the next stop. Don’t get me wrong some are very pleasant but others are just plain ignorant. I reached Espalion, it’s bigger than I thought. Everything closes in. Keep walking, just keep walking, I do and within an hour I’m regretting it again. 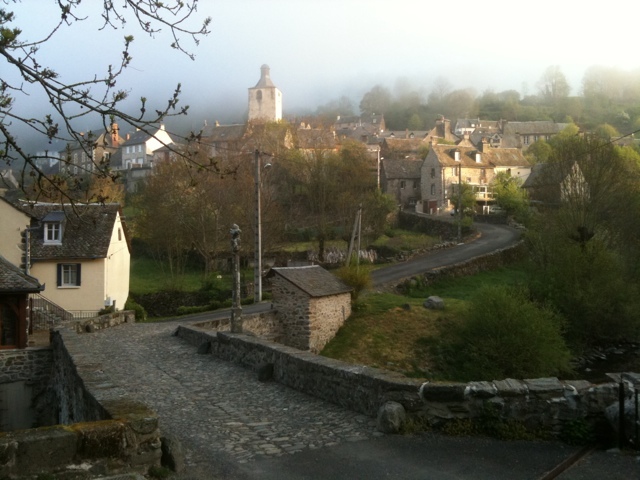 I keep up my march until I finally reach Estaing. I’ve been here before, I think?! For the first time I find a tourist office that is open, she directs me round the corner to a pilgrims l’hospitale, run by a lovely religious couple, you pay as much as you can afford, and that includes eating with them. It’s busy and so I have a top bunk, it’s a bed. Also this is the first time in a week when I’ve been accepted for being a pilgrim without being ripped off! I feel all warm and fuzzy… Despite missing people back home.